This week, Vietnam and Cambodia held another iteration of a meeting designed to advance the promotion of cooperation between their local provinces. The meeting spotlighted ongoing efforts by both sides to realize opportunities and to manage challenges that arise from their shared border as among the priorities for the promotion of their wider security ties for 2019. As I have observed previously in these pages, Vietnam and Cambodia share a defense relationship that extends across several different areas. These range from opportunities, such as Vietnam’s provision of the Royal Cambodian Armed Forces (RCAF) with equipment, training, and aid, to challenges such as the joint management of their shared 700-mile long border. Both sides have been continuing to manage the border issue as they develop their wider relationship into 2019. When Prime Minister Hun Sen met with Vietnamese Prime Minister Nguyen Xuan Phuc last month, among the items both sides had agreed on was to speed up the demarcation of their remaining land border. Similarly, when a high-ranking Vietnamese delegation led by Defense Minister Ngo Xuan Lich was in Cambodia to outline defense priorities for 2019, border-related matters also factored in there as well. This week, the border management aspect of the Vietnam-Cambodia security relationship was in the headlines with the convening of the 10th meeting on cooperation and development of border provinces. The series of meetings is among the range of mechanisms through which both sides manage their border issues, and the last iteration was held back in 2017 and hosted by Cambodia. This iteration of the meeting, held from January 9 to 10, was co-chaired by Vietnam Deputy Prime Minister and Minister of Foreign Affairs Pham Binh Minh and visiting Cambodian Deputy Prime Minister and Interior Minister Sar Kheng. During the meeting, which reportedly featured over 200 senior leaders and officials from both countries, the two sides took stock of the state of their border cooperation and also outlined some areas of priority for 2018. Both sides outlined some of the areas of progress that they had made in recent years, even as they remained aware of the challenges that remain. According to Vietnamese state media, in their remarks, both officials praised the regularization of mechanisms such as the meeting to advance border ties and noted some positive trends, including more regular interactions among local personnel and the advancement of border trade, targeted for $5 billion. A joint statement released following the meeting specified some of the items both sides had agreed to. This included general restatements of principles as well as some agreed priorities, including the upgrading of border checkpoints, the construction of additional infrastructure such as bridges and roads, and the advancement of wider collaboration such as on forestry, agriculture, tourism, trade and cultural exchanges. Unsurprisingly, no further specifics were publicly issued in terms of how exactly both sides plan to advance these priorities. In order to evaluate that, one will have to look to developments that will play out for the rest of 2019 in this area and other related ones between the two countries. 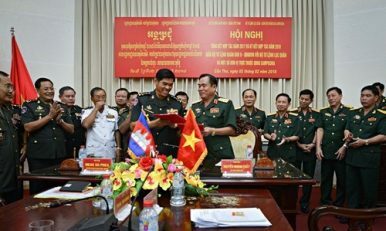 What’s Next for Vietnam-Cambodia Border Cooperation?Vietnam-Cambodia Military Relations in Focus with Defense Minister VisitVietnam-Cambodia Joint Patrols Highlight Defense TiesMekong Military Ties in Focus with Border ExchangeWhat’s Next for Vietnam-New Zealand Military Cooperation?